Anything that can make litter box duty a little easier would be a welcome addition to your regular routine! But what type of litter is best for your pet? And how do you know which brand to choose? In this review, we’re going to introduce you to clumping kitty litter. This special type of litter can make clean-up a breeze and help keep your home smelling like anything but a litter box. There are lots of brands to choose from. Fortunately, we’ve “sifted” through leading brands (no pun intended) to help you find the best scoopable cat litter for your animal—whether you’re brand new to the feline life or if you’ve been a fur-parent for years. How Does Clumping Cat Litter Work? Do You Need to Switch Litter? Is Clumping Litter Safe for Kittens? Clumping cat litter is a special type of litter that helps your kitty’s waste clump together. Both feces and urine will solidify into various sized chunks or clumps. These clumps can then be easily removed with a scooper or small shovel. It stays clean! This means you don’t have to fully empty and change your kitty’s litter box as often (though you’re not completely off the hook, even with the best clumping cat litter). Instead, you can simply add a little bit of extra fresh litter as needed in between full cleans. Compare this to non-clumping litter, which is what virtually all types of cat litter were back in the day. While it may be less expensive, non-clumping litter usually has to be emptied out more often, since the bottom of the box becomes saturated with urine over time. This is because the urine will spread out and settle rather than clump together in convenient little clumps. Essentially, non-clumping cat litter can be a huge hairy hassle to clean…you pretty much have to change the entire box at least once a week to keep hygiene up and smells down! So, for people who are willing to spend a little more to save a lot more on time and convenience, clumping cat litter is usually the obvious choice. In order for clumping litter to work properly, it needs to be super absorbent. If you take a look at the labels, almost all of the best clumping cat litter will contain a substance called bentonite clay. Bentonite clay is super absorbent—whenever it comes in contact with liquid, it’ll bind together and form a hard solid mass. All you need to do then is a little excavating with your little shovel and you’re good to go! How well does the clumping action actually work? Does the urine stay together in a large hard mass, or does it fall apart easily? Clumps should be large and not fall apart too easily when you go to pick it up with your scooper or small shovel. Ideally, the clumps will form quickly, as well, and stay toward the top of the litter for easier clean-up. We all know cat owners have litter boxes…but that doesn’t mean we want to know it with our noses! The best clumping cat litters should still be able to contain and eliminate smells (thanks to ingredients like baking soda). This is especially important if you keep your litter box in a high traffic area such as a bathroom or mudroom. Some clumping cat litters come with a scent in addition to an odor-blocking ability. This may be fine for you and your kitty. But if your animal has skin sensitivities, this may not be ideal—in which case, an unscented clumping kitty litter would probably be best. Plus, some pet owners may not like the smell of scented cat litter. Sure, it may say “lavender” or some other pleasant odor, but if it disagrees with your nose you certainly won’t want to be smelling it in your home. Even if “unscented,” certain types of kitty litter has its own smell anyway. But his may not be a problem, depending on how sensitive your nose is. Dust-free means better cleanliness and indoor air quality—which is good not only for your kitty but for the rest of your family, too. Take a look when you go to pick up the clumps of urine and feces. Is dust emitted into the air? When looking for a good scoopable cat litter, you want minimal dust so there’s less to clean up…and less for your kitty to inhale or track all around your house! This may be important to you if you’ve been trying to go green recently. Many affordable and high quality clumping litters are made with natural ingredients like walnut shells and wood. But another HUGE plus to biodegradable litter is that in most cases it can be flushed down your toilet! Talk about easy. Deciding when and how to switch kitty litter is a largely personal decision. Keep in mind that your litter choice will vary depending on things like how many cats you have, how much and how often your pet urinates and defecates, and whether or not your pet has a picky temperament and avoids new brands. Does your cat seem aversive to using the litter box? Are you frustrated with how often you have to empty out and clean the litter box? Are you concerned that your pet is tracking a lot of litter all over your home? Do you have multiple cats? If you answered yes to any of the above questions, you may want to consider trialing a new type of clumping litter. Kittens are young. They’re learning how to clean themselves, use the litter box, and basically become a fully functioning furball. They’re also insanely curious and love to put things in their mouths, like all babies do. For this reason, some pet parents are concerned about using clumping cat litter for their littlest felines. Some of the ingredients in clumping cat litter (or the small clumps of urine and feces themselves) may cause intestinal blockages or other problems if ingested by your kitty. And since little cats aren’t quite as good at the whole grooming thing, they may be more likely to consume litter particles compared to their older companions. The thing is, there’s no scientific proof that clumping cat litter can be harmful to cats. Ultimately, there’s no evidence to say that clumping cat litter isn’t safe for kittens, but as a pet owner, you may ultimately need to make your own call about this one. The difference in ease and convenience that the best clumping cat litter makes is HUGE. Most pet owners never go back to non-clumping after they’ve experienced it for themselves. If you’re convinced it’s time to try a clumping litter (or try a different one), then start with these 10 brands. They’re the cat’s meow when it comes to price, effectiveness, and customer reviews. This all-natural clumping litter is free of perfumes, deodorants, and plant proteins (all of which may irritate sensitive kitties). It promises superior odor control and a 99.9% dust-free rating. It also features heavy litter granules to avoid tracking and mess. 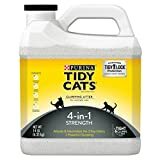 In addition to mechanical litter boxes, this heavy duty litter can also be used in homes with multiple cats. The large hard clumps are super easy to remove, minimizing clean up time and improving odor control. It’s not called “World’s Best” for no reason! This litter product has minimal dusting and has a fast-acting clumping ability to make clean-ups faster than ever. Because it’s biodegradable (made from renewable corn kernels! ), you can go ahead and flush this litter down the toilet, too. While some users say the clumping ability is on point, others disagree—but this might depend on how many cats are using the litter, as well. 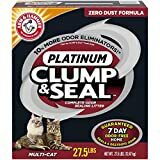 We have to say, the claims this clumping litter comes with are pretty impressive: 7-day odor free guarantee AND 100% dust-free platinum formula? Don’t mind if we do! Turns out, renowned brand Arm & Hammer may have figured it out. This is a bestselling product that seems to have a lot of positive reviews overall. It features a “patented” formula that locks in scents, even if there are multiple kitties in your home using the feline lavatory! Boxiecat is a crowd favorite among our best clumping cat litter list. It forms hard clumps quickly, is unscented, is resistant to tracking, and is also soft on your kitty’s paws. Plus, it’s easy to scoop and contains a “probiotic-powered odor control” feature that makes it perfect for households with multiple four-legged furballs. Ever think they give out awards for kitty litter? Turns out they do! This brand is the winner of the winner of the Cat Fancy Editors’ Choice Award. Don’t let the unusual look fool you! While some reviewers compared this clumping kitty litter to “coffee grounds,” most people seem less concerned with look and more concerned with effectiveness. This is an environmentally-friendly choice is made with walnut shells—free of clay which can give off dust particles more easily. It’s also apparently pretty cost-effective, with the manufacturers claiming that just one bag is equivalent to three bags of the leading clay litter. Cats seem to really love this stuff! The manufacturers state that it’s safe to use as training litter for kitties (though remember: this may be a case by case basis depending on your young’un). But cats of any age appear to like it, so don’t worry if you have an adult feline who needs a new litter. It’s also 99.5% dust-free, all natural, and has a soft texture so it’s gentle on pet paws. Just watch out if your cat is wet and goes inside…it can make the litter difficult to remove. 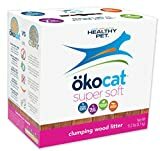 Lightweight and effective describes this natural wood clumping litter. It’s soft on your pet’s paws and allegedly can absorb up to 500% of its weight in liquid! 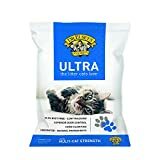 The dust issue is minimal to none, and most users seem to agree that it is extremely economical and cost-effective, especially compared to other kitty litter brands. NO AIRBORNE DUST: Easy breathing and a cleaner, healthier home. This is another clumping cat litter that comes vet-recommended. The product promises to be quick-clumping, excellent at odor control, and biodegradable as well. It’s also free of added dyes and perfumes, making it an ideal choice for your skin-sensitive kitties. 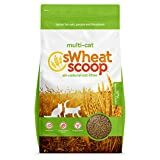 The product contains wheat, which has enzymes that neutralize unpleasant smells and starches that clump quickly (great for a home with more than one feline family member). And according to the company, it’s septic safe, although some reviewers don’t flush it down their toilets out of caution. Another benefit of the wheat in this litter? Some reviewers have noticed that their cats actually have better stool, probably thanks to the inadvertent ingestion of some extra fiber that they get from cleaning their paws. “No smell, can’t tell” is the tagline for this litter. It’s all natural and made out of 100% grass, making it super lightweight and easy to handle. The texture is sand-like, giving it a realistic feel that most cats really seem to enjoy. So, if you end up transitioning your animal to this brand, the process hopefully should be relatively simple. As soon as your feline does her duties, the clumping action begins immediately. This allows you to scoop out the waste soon and further reduce the risk of unwanted odors. At 99% dust-free, you and your cats can avoid respiratory issues. By the way, don’t let how lightweight it is fool you. Reviewers note that a 20 lb bag lasts as long as a 40 lb bag of traditional litter, even with multiple kitties. Any cat owners probably are aware of the three main smells coming from cat litter boxes: urine, feces, and ammonia. 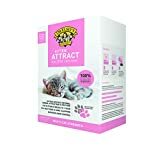 This scoopable litter from Purina can eliminate all three and trap the waste into small tight clumps for easy removal. It’s designed specifically for households with multiple cats and has a 99.6% dust-free promise, making pouring and clean up a lot easier on your lungs. It’s made out of natural clay and comes in an easy-to-pour container. Unfortunately, some users have found that the clumping ability of this litter isn’t up to par compared to other brands, doesn’t wick up moisture quite as well. While cleaning the litter box may not be your favorite part about owning a cat, it’s certainly an essential chore. But if you’re going to do it, you may as well make it as easy as possible! If you’ve been thinking that it’s time for a change to your cat’s litter box, keep this review of the best clumping litter handy. It’ll be a helpful reference for the next time you shop online or head to the pet store. No matter which brand you choose, the important thing is to select one that your cat will like. This may take a bit of trial and error, but knowing your cat’s personality and needs is helpful this regard. Does your cat have skin issues, allergies, or sensitivities? Is your cat picky or a bit more easy going? Answering these questions should help you narrow down your choices. Compared to traditional cat litter, clumping cat litter can save you a lot of time and energy. Get the right product, and your kitty, your time, your money, and your nose will likely thank you!